Summer is definitely in full swing and that means that you are more likely to find me on my patio rather than indoors. A couple of years ago we transformed our pretty much unused patio into an outdoor living room and it has become my absolute favorite spot. Not only did it add a ton of usable space to our home, but it is the perfect spot for entertaining friends and family or just sit and hang out the four of us. 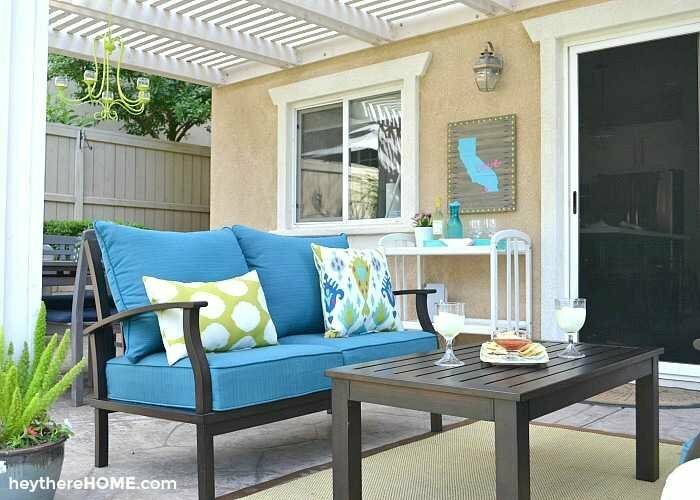 The goal was to make this outdoor living space as comfortable as our living room. It didn’t take much, but there are definitely some things to consider so today I want to share with you my best tips for creating your own amazing outdoor living space. I think we can all agree that the number one must have in any hang out space is a comfortable place to sit. There are so many options out there, but when it came to making our final investment in some nice outdoor furniture we went with metal (that looks like wood) and I have to say it is by far the best decision we made. The cushions came with our set and although we store them in our shed for about 2 months out of the year they have been out in the rain and sun for 2 years now and have held their color and shape perfectly. If you aren’t ready to invest or you want specific seating dimensions you could also take on an easy build for your outdoor seating. Two of my super talented friends built their own outdoor furniture and got just the look they were going for and it was really budget friendly. My friend Aniko from Place Of My Taste, built her own pallet furniture and I love the colors she used. Ursula at Home Made by Carmona also built her patio furniture from scratch but went with a really clean and modern look. 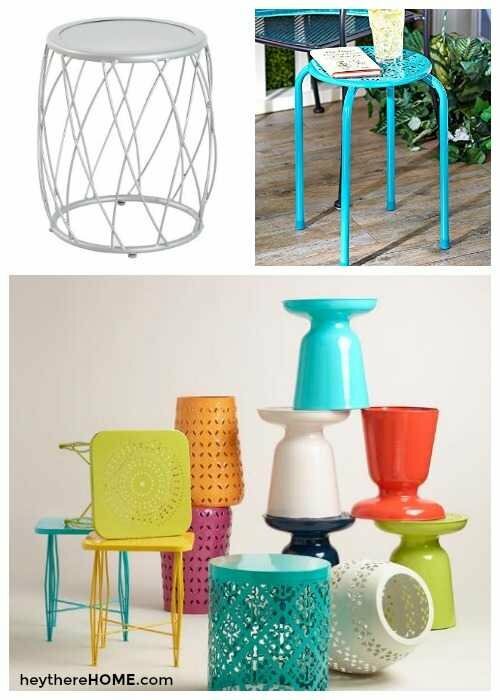 Not only are small outdoor tables really useful to set your drink on but they are the perfect excuse to add a fun pop of color or interesting shape to your outdoor space. These are some of my faves from around the web. -Links to each below. Of course the easiest way to get some shade is with an umbrella. They can be pretty inexpensive and you can get one that tilts to take your shade up a notch. The best thing about umbrellas is that you can move them around as needed and they come in every color of the rainbow! 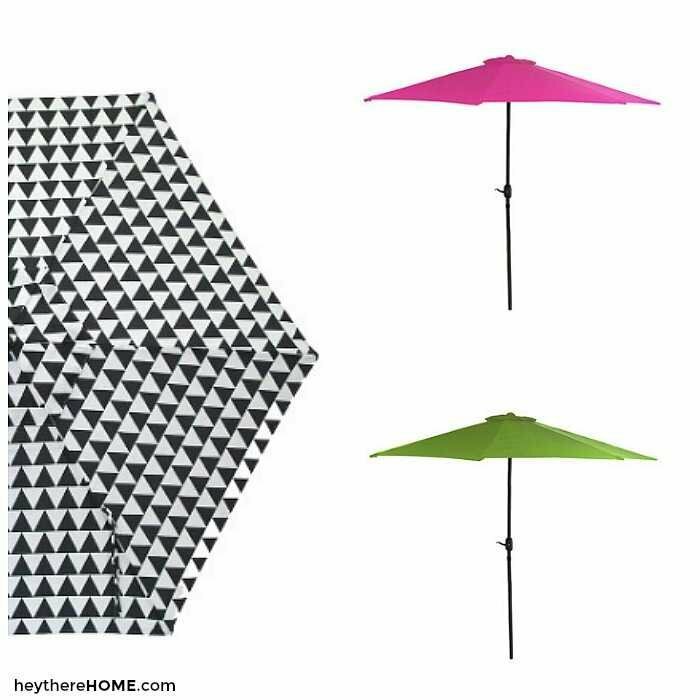 And I absolutely love this idea to take an ordinary outdoor umbrella and made it really fun! In our backyard I literally couldn’t sit on my patio in the evening without being blinded by the sun, which was totally getting in the way of my happy hours so I made my own outdoor curtains out of drop cloths and hung them up on a DIY outdoor curtain rod. They not only block the sun, but they make the space feel like a real outdoor room which I love! Another decently inexpensive way to add some shade (not to mention a really sleek look) is with sail shades. I could totally hang out here, couldn’t you? I did a little digging and found that you can buy premade sail shades in so many fun colors right here. And of course the mother of all shade structures, but definitely a weekend project is to build an actual pergola. There are a ton of plans out there that you can make your own just like this couple did and they said they did it for under $500 which is way less than if you had to hire someone to do it. 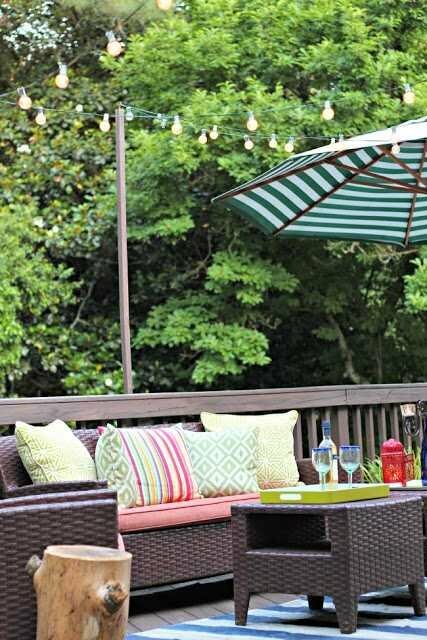 String lights for my outdoor area are definitely on my list of things to add to my space and I absolutely love how these string lights look. Actually I love this entire outdoor patio area from Southern State Of Mind. But for now we rely on out patio light and my candle chandelier that I made from our old dining room light. I think this might be my favorite thing about this entire space. 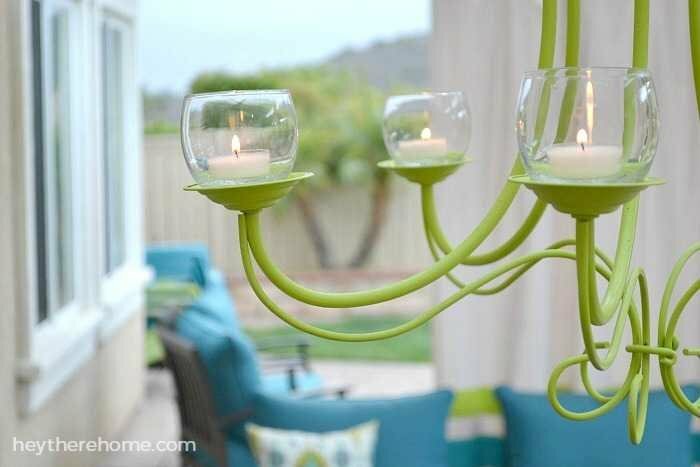 I’m pretty sure that you can’t have enough candles in an outdoor space. They create the perfect mood and are just so dang pretty right? Ok. Now we’ve got the function down, but that is just part of any room’s equation. Adding an outdoor rug will solidify the idea that this really is an outdoor living space. 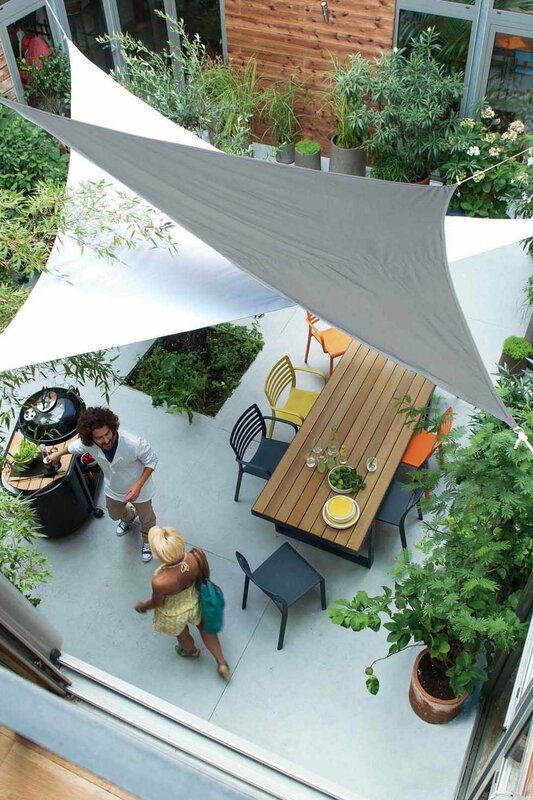 It really brings the indoors outside any time you can add textiles to your outdoor living space. 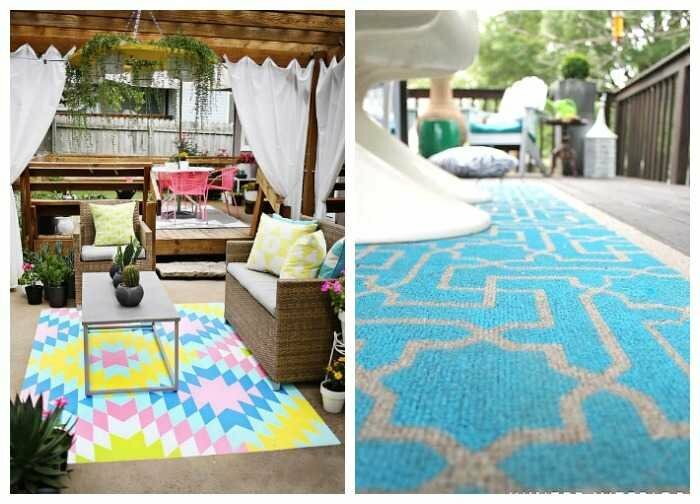 And if you are going to add a rug, you might as well make it colorful, which you can do even if you can only afford a basic outdoor rug. Yep! You can paint it! The gals over a A Beautiful Mess painted a really fun and colorful pattern on their outdoor rug. And Kristin kept it a bit more traditional and used a stencil to paint an inexpensive outdoor rug. 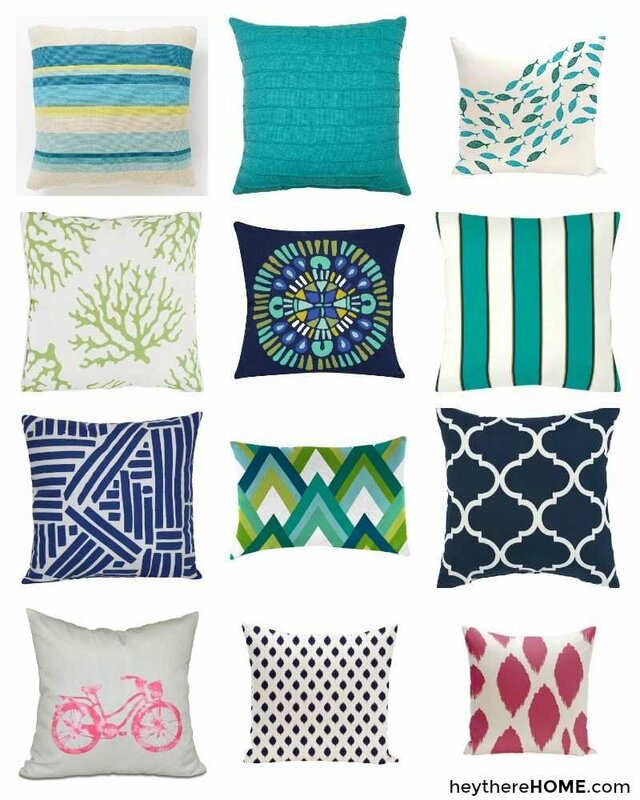 And of course you’ve got to have some comfy pillows, one of my fave ways to add a ton of color and there are literally thousands to choose from. 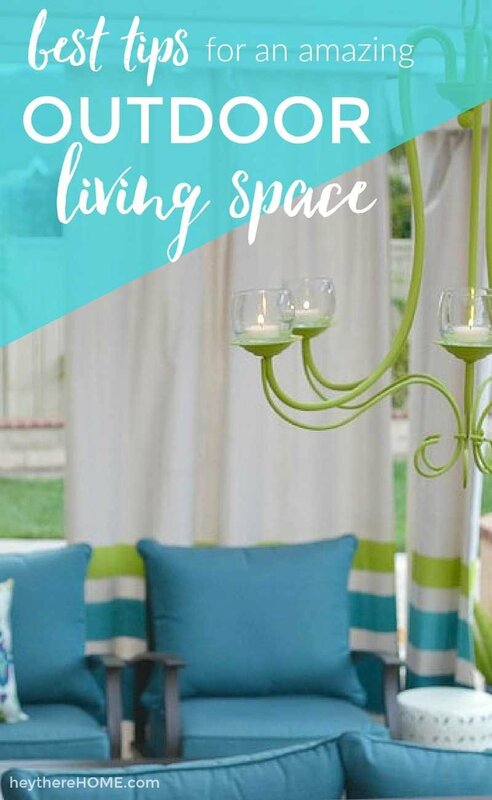 These are some of my faves from a bit of browsing I did, but each of the sites linked below has pages and pages for you to browse for you to find the right colors and patterns for you outdoor living space! Most of these come in many different colors. Click the links below to see your options. And that there is a wrap! I’m sure you are now ready to go tackle your own outdoor space and make it totally fabulous and fun so I’ll leave you to it! Have a great day and be sure to follow me on Pinterest where I’m always gathering inspiration and ideas like these! I love how you point out that comfortable seating is the number one must have in a hang out space. Thanks for making the point that metal is so easy to maintain. My husband and I are trying to redecorate our outdoor space, and I think we would really love some nice seating. Maybe a hammock would be fun! Thanks for the tips. You’re so welcome Monica. That hammock would be so fun and relaxing! 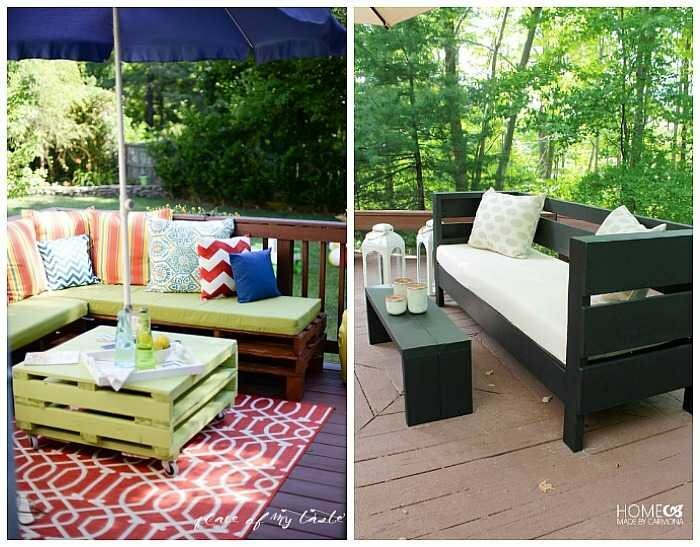 Love your outdoor furniture! The blue is the color I’ve been searching for😊 Can you tell me where you purchased it? Hi Dana, We bought the allen + roth set from Lowes, but it looks like they aren’t making that patio furniture collection anymore. I found this fabric for you that is a pretty close match. Hope this helps!